Stockcars will “Play Rugby” with a Rugby ball made of truck tyres and bolted together, Rules along lines of teams rugby but with the BALL as target!, a superstock referee will be in the centre of the field should the ball go off the track. Each team in the RWC will be represented by a car or 2 and points go to whoever gets it over the start finish line the most. There will be Player of the Day awards, Most improved player, player in the spirit of the game etc. 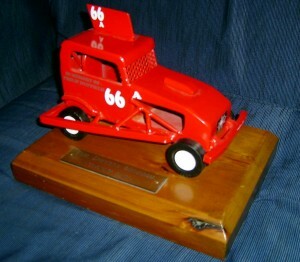 It will also be the Philip Duffield Challenge for Adult Ministocks, It is 9 years since Philip lost his life racing at Ellesmere and this is a fantastic trophy and the first time his children will be able to present it themselves, Pictures of trophy attached too. It is all part of the Best of Mid Canterbury Festival being held while the Romanian Rugby Team are in Ashburton so there will also be Romanian Food available as well as all the usual food and a large Market area as well as Bouncy Castle and Rides for kids so there’s something for everyone. All for just $12 at the gate, action starts at 12.30 but drivers must be ready by 11.30am for grand parade etc. All other grades racing (saloons, productions, six shooters, sidecars & more) so heaps of action.